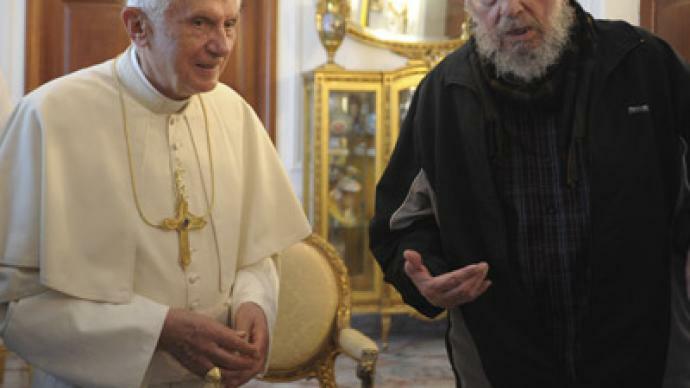 Pope Benedict XVI has met with Fidel Castro during his official visit to Cuba. The meeting came after the head of the Catholic Church addressed crowds on Revolution Plaza in Havana, with demands of greater freedom for the Catholic Church in Cuba. ­Pope Benedict XVI and Fidel Castro spent about half an hour behind the closed doors. No details on the topics discussed have been released yet. “Cuba and the world need change, but this will occur only if each one is in a position to seek the truth and chooses the way of love, sowing reconciliation and fraternity,” Pope Benedict XVI said before the meeting in front of hundreds of thousands of people. The Pope's speech was considered by many as a severe criticism of the Cuban reality, the Church's insignificant role in society, religious intolerance and atheism. Benedict XVI’s US publisher and his former student, Rev. Joseph Fessio, said that ‘truth’ and ‘freedom’ were indeed the key words of the Pope’s speech. “Does anyone in Cuba not know how the words themselves condemn the reality there?” Rev. Fessio asked. Thousands of Cubans greeted the Pope in Revolution Plaza waving banners and shouting: “Viva Cuba! Viva el Papa!” Revolution Plaza, which holds up to 600,000 people, was nearly filled to capacity. However, many people were reportedly leaving right after registering their presence. Many of those attending the Mass said they had been forced by their employers and teachers to come.